In the historic medieval town of Pistoia, located just 40 minutes away from Florence, the quaint city districts are alive with a culture that extends back to the 1200s where the Bear Joust first took place. The Joust, which is not as medieval or gory as it sounds, exemplifies the unification celebration of a town built by the foundation of four historic neighborhoods represented by both mythical and worldly creatures: the Dragon, the Griffin, the White Deer and finally the Golden Lion. This event testifies to the rich and vibrant history of Pistoia, which currently holds the title of Italian Capitol of Culture for 2017. Celebrated annually on the feast day of St. James (July 25), the Bear Joust begins in the morning with a grand procession of over 300 participants who are dressed in an array of trappings that represent the colorful costumes and traditional pageantry worn since the birth of this event. 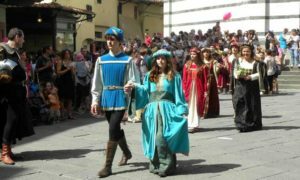 This procession begins with the four neighborhoods that eventually conjoin in one unified march to walk together around the medieval walls and streets of Pistoia. Following the procession, traditional methods are used to determine who will be chosen as representative knight for their neighborhood. Of the four neighborhoods, there are three knights allotted to each, who will then participate by horseback and attempt to joust a pair of stylized cardboard bears. This is followed by a Cathedral Mass is held in honor of St. James and then around 9:30 pm The Bear Joust begins and lasts for about one hour and a half. Admission is €20 to watch the spectacle from up close. Competing for the pride of their own neighborhood, as well as the palio (banner) that signifies the ultimate victory and pride bestowed on that neighborhood, the entire event is conducted by musical cues that signal to the Jousters when to begin their show of heraldry. At the end of the event, the competitor with the highest score achieves both the coveted title “Knight of the Golden Spur of Pistoia and Countryside,” as well as the eloquently designed palio (banner) that will be draped over the shoulders of the victorious knight. A board appointed by the Mayor of Pistoia commissions a local artist yearly to create the palio, so the design of the banner varies from year to year and remains an important tradition as well as the final cue that the event has ended. Although the Joust is famous and dates back to medieval times, the practice was actually halted during the at the beginning of the 20th century through the First and Second World Wars. Reinstated in 1947, The Bear Joust continues on into modern times and attracts interest internationally.